For several years I have worked every Sunday, either on farmers markets or in the bakery. Happily our delivery scheduled has recently change and now I can roll out of bed at 9.50 instead of 5 or 6 am - a complete luxury. I can't quite stop myself gazing up at the leaden skies with horror at the impending rain, but it will take ages to get out of that habit! Because of our work history we don't eat Sunday lunch in our house, but we do have a good Sunday supper. Selling at farmers markets every weekend meant that by Sunday evening our fridge would be stuffed full of delicious buys and swaps - enough to see us through the week and beyond. Sunday evening was a quiet moment to savour a fridge full of seasonality and carefully crafted products, a luxury that would have be unattainable on our normal income so we relished our luck. I really don't miss the hours, the cold and the back ache, but when it come to Sunday evenings and I start to put a meal together, I really miss the amazing foods that we used to enjoy everyday. Nigel Slater had a recipe on Simple Suppers recently which elicite moans of delight in our living room - it was duck stuffed with red cabbage. However it wasn't the duck which garnered the emotion but the cabbage! So this was Sunday's supper: duck legs braised with red cabbage, served with puy lentils and roast potatoes. As both the meat and potatoes are off limits for me, I baked a stuffed baby squash with brown rice, beetroot, leeks & fresh ginger and will blog this shortly. You can cook this recipe with a whole duck, either by jointing or leaving the bird whole. If you do use a whole bird, prick all over before frying all over and adjust the cooking time according to the weight of the bird and the cooking instructions that came with it. Most recipes add sugar to the red cabbage but with the prunes, pommeau and apple you should find that the recipe is sweet enough. If you need a little more acidity you can add the juice of half a lemon or 10 ml (1 dsp) red wine or sherry vinegar. Stab the skin of the ducks legs all over with a fork and then put them skin side down in a frying pan. Shred the red cabbage finely and chop the apple (core but don't peel). Put 2 dessertspoons (20ml) duck fat from the rendering legs into a heavy-bottomed casserole (with a lid) over a low heat. Add the red cabbage and a sprinckling of salt then toss gently in the fat to soften. Add the chopped apple and the cumin seeds, stir to combine then pour in the prunes and pommeau. Pour in 200ml red wine and season well with black pepper. Pour over the chicken stock then bring the pan to the boil, . Strew over the thyme sprigs and lay the ducks legs over the top. Put a lid on the casserole and put it into the oven at 160°C for an hour or so. Lots of braised dishes benefit from resting 24 hours before serving and this is no exception. Stick it in the fridge and warm through the following evening and you'll find the flavours even more pronounced and delicious than if you ate it straight away. Of course, we couldn't wait and devoured the lot as soon as it was cooked, hence no plate shots! 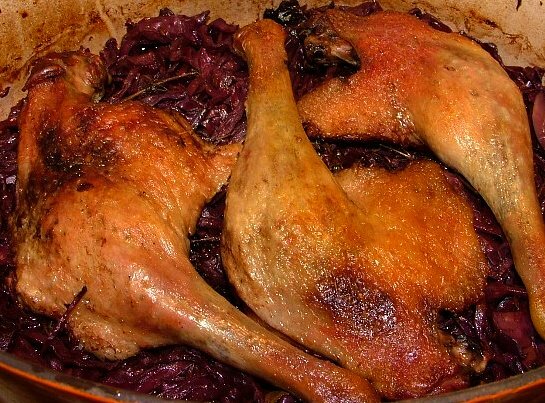 This looks delicious, I cooked something very similar the other week, duck and red cabbage go beautifully together. Keep on enjoying those sunday lie-ins.